After earning Bachelors in Physiotherapy I grew interest towards Sports and Ortho so I got enrolled me for Masters in Physiotherapy which I completed in 2011. Soon after my post graduation I became a faculty member in Institute of Health Sciences which comes under Utkal University, Bhubaneshwar. Continuing the same role in imparting education, I'm presently working in Ayushman College of Physiotherapy in Bhopal, Madhya Pradesh that is located in Central India. I intend to work for Physiopedia with my motivation of further study and research in Physiotherapy. The inspiration comes from my previous job as a Lecturer in Bhubaneshwar. I had an impulse to get PT students excel in their performance and I was keen to increase their interest in the subject with the latest upcoming in our field. I'm also the President of Royal Global Welfare Society registered under Indian Government Society Act 1860. Its running an academy who runs online courses on Basic Office Ergonomics and Ergonomic Workplace Analysis as well as on Fibromyalgia - A pragmatic approach to Gauge, Manage and Ergonomics. We have also organized free webinars under it. Recent webinars were on Dry Needling and Physiotherapy for people living with HIV/AIDS. 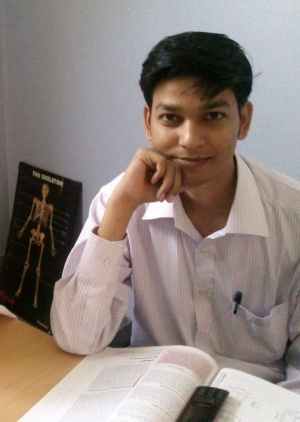 I've also served for more than a year as a Clinical & Academic Physiotherapist in an organization in Bangalore, India. My field of expertise was Musculoskeletal Disorders, Sports, Pediatrics and Ergonomics there. I'm passionate about teaching and I would take Physiopedia as a platform to share and learn more about Physiotherapy and would try and give latest updates about the Evidence Based PT. Member of International Society of Arthroscopy, Knee Surgery & Orthopedic Sports Medicine. Asst Professor, USB College of Physiotherapy, Abu Road. Responsibilities includes scheduling, managing and taking classes for Bachelors. Paper setting and checking for varied universities. Author of the book: “Hip muscles strength and Patellofemoral pain syndrome: Comparison of strength of hip abductors and external rotators in individuals with & without PFPS” published under Lap Lambert Academic Publishing. Organised by and held at RECOUP Neuromusculoskeletal Rehabilitation Centre on 22nd February 2013 at Bangalore. Organized by and held at RECOUP Neuromusculoskeletal Rehabilitation Centre on 30th April – 3rd May, 2013. Resource Persons: Prof. Daniela Columbini, Prof. Enrico Occupinti, Mr. Enrique Alvarez Casado, Dr. HasanSadeghiNaeini, Dr. Ajay Patwardhan and Dr. Deepak Sharan& team. • Ethics of physiotherapy practice. Seminars attended during the course of M.P.T. • Attended first all India Student Conference in 2005 organized by South Karnataka Physiotherapy Teacher Association in Mangalore. • “Feel employable” learning and development intervention conducted from 23/6/06 to 25/6/06 under the college for leadership and human resource development. • Attended CME on “Essentials of sensory integration” on 14th July 2009. This User is a member of the Musculoskeletal / Orthopaedic group, Paediatrics group, Sports Medicine group, Rheumatology group, Older People group, Pain group, Mens Health group, Extended Scope group & Amputees group.